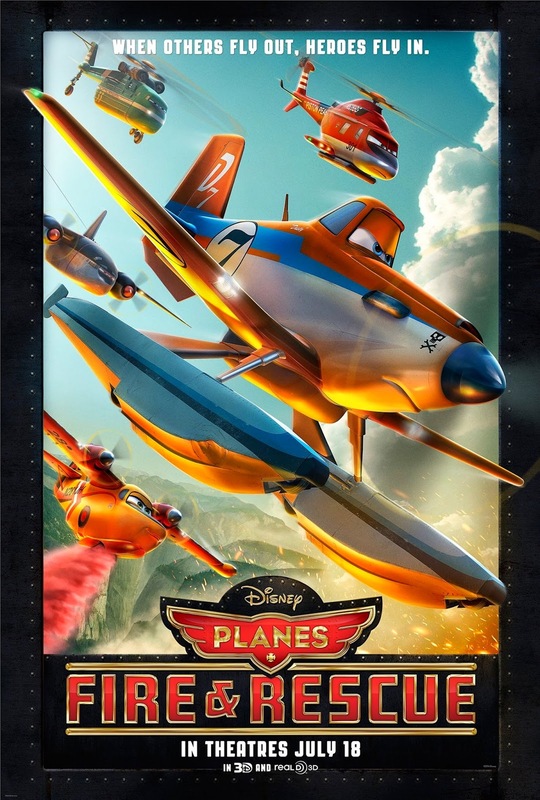 Well this movie is a sequel to Disney’s Planes which was released about the same time last year and is itself and a spin-off of Pixar’s Cars. This movie Planes: Fire and Rescue, is actually the second in a three part series. 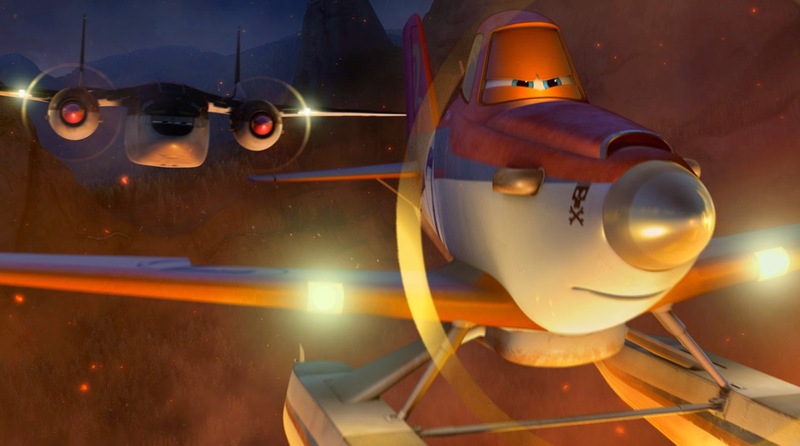 In the first film, the story revolves around the main character, Dusty Crophopper who goes from the average crop duster to a world famous racer. Planes: Fire and Rescue picks up right after that. Admission time, I did not watch Planes, so I really can’t say if this movie lives up to the previous or even follows through very well. So I’ll judge it on its own merits. Anyway, back to the review. This movie picks up where it left off in Planes and there’s a quick little catch up at the beginning of the movie for those that didn’t get to watch Planes, in other words it isn’t really necessary to watch planes to catch up to this one or to get a backstory or anything. So Dusty Crophopper by this time is a famous racer. He’s won tonnes of trophies and is recognised and loved by everybody. He returns home to Propwash Junction to help out with an upcoming festival but on during a quick race arond the neighborhood with his mentor something goes wrong. He finds out that his gearbox is now damaged and that from this point on he can’t push himself. His friends do all they can to find a replacement of course but Dusty’s gearbox was a one-of-a-kind and finding it will take time. The evening that he finds out about this he’s a little depressed and angry and is on his own flying. He gets it into his head that the damage isn’t as bad and pushes himself to the limit. Bad idea. His engine blows and he crashes into the airport causing a fire. The ground crew put it out of course but they do it by crashing a water tower into the flames. This is bad. Soon the officials are there and asking questions about what’s happened and questioning the old firetruck that’s assigned to the airport. The come to the decision that he’s too old for the job and if he’s going to stay on he needs to be upgraded and that he needs an assistant. Dusty feeling responsible, volunteers for it. But to be an official firefighter he needs to get certified and this means finding Chief Blade Ranger over at Piston Peak National Park. So off Dusty goes to Piston Peak and the usual happens. There’s someone there that likes him but overall he isn’t immediately accepted by everyone and finds it a little hard to fit in. Chief Blade Ranger of course doesn’t warm up to Dusty immediately and is hard on him. There’s the usual training scene and then of course the first try and doing the new job which of course he doesn’t do very well and is reprimanded by Blade. And because he can’t push himself anymore and that effects his ability to do what needs to be done, this of course makes Blade get on his case. And because this disability is something he’s ashamed of, he doesn’t tell anyone. Blade Ranger is of course the boss of the smoke jumpers and ragtag bunch of professionals who all decided to try firefighting when they moved on from their previous careers. Blade of course has his reason for being the tough act that he is and why he’s so tough on everyone. But I won’t go into that here. Best you go watch on your own. Anyway, so he trains and makes mistakes. Blade gets on his case of course and eventually they both sort of have at each other during one particular mission when Dusty isn’t paying attention when Blade is giving him instructions. When Dusty crashes and Blade does everything he can to save him that’s when Dusty finds new respect for Blade. Okay, so that’s the story. As I said earlier you don’t have to watch Planes to enjoy this one so you can just go in there and enjoy yourself. But the question is will you enjoy yourself? Well, visually speaking it is beautiful. The aerial scenes where you fly with Dusty through the environment is amazing, as are the background scenes. The characters? Well if you’ve seen Pixar’s Cars or Disney’s Planes then you’ll know what you’re in for. As for the story? Well, this is the question that you need the answer to. I tried to watch this from the point of view of a child. Of course, the fact that I act like a child sometimes is no indication that I can think like a child but let’s ignore that for the moment. Anyway, to me this movie sort of will appeal to kids but not all kids. The story is a little too heavy, you sort of need to pay attention which most children won’t have. The other thing is is that the HA-HA’s are few and far between. So hoping your child will be patient enough to get to the scene that will amuse them will be a test of patience for them. This movie is for those kids that do have the patience, those kids that if you stick them in front of any cartoon will sit through it without even blinking or complaining. This is for them. The pretty pictures and cute characters I don’t think will be enough to keep the very young quiet for long. In fact, we sat in front of a family with two little ones and they were bored a little under halfway through the movie. If that doesn’t say something about this movie than i don’t know what will. So to sum it up, I give this movie a 2 out of 5. It’s a little too dull for the kids to sit through and firefighters talking in their jargon probably won’t have the kids laughing out loud either. THANK YOU VERY MUCH NUFFNANG AND WALT DISNEY STUDIO MOTION PICTURES FOR INVITING US TO THE PREMIERE SCREENING! AND THANK YOU MBO CINEMAS@CITTA MALL FOR HOSTING US!